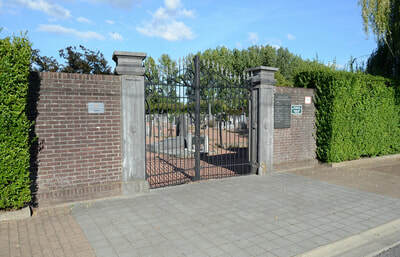 The village of Rekem is located north-east of the town of Maastricht on the N78. From the motorway E314 which runs between Aken (Aachen) and Antwerpen turn off at junction 33 Maas-Mechelen and onto the N78 direction Rekem. 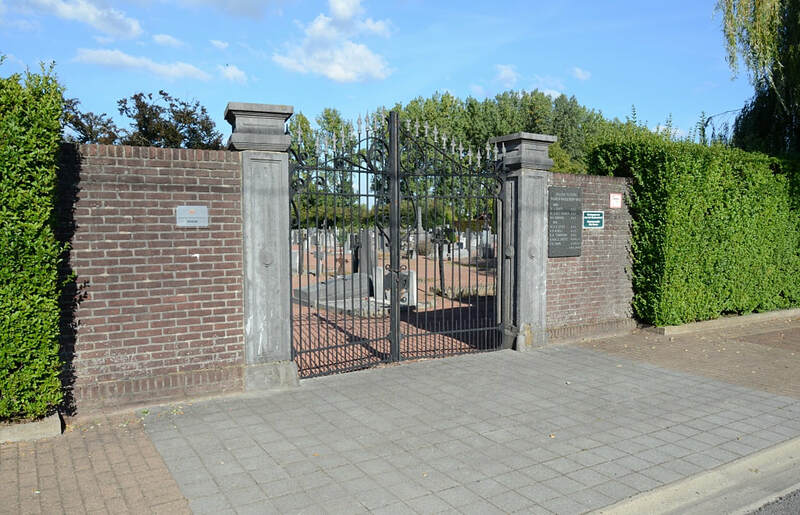 On entering the village take the first turning on the left called Groenstraat, then take the first turning left into Stenebrugstraat and first right into Gauwakkerstraat and the cemetery is along on the left. 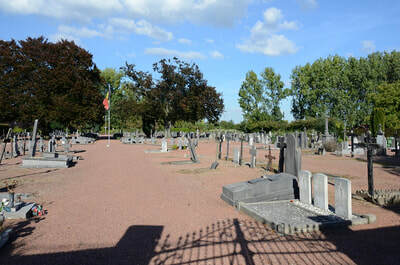 The graves are located on the left hand side of the entrance. Rekem Communal Cemetery contains the graves of eight airmen of the Second World War, one of whom is unidentified. R/68209 Sergeant Donald MacLachlan Duffy, Wireless Operator/Air Gunner in 10 Squadron, Royal Canadian Air Force, died 19th August 1941, aged 22. Son of Leslie Lyle Duffy and Mary Elizabeth Duffy, of Alvinston, Lambton Co., Ontario, Canada. Inscription " Well done, thou good and faithful servant" St. Matthew XXV. 21. 10282 Pilot Officer William Alan Strathern Evill, Pilot in 10 Squadron, Royal Air Force Volunteer Reserve, died 19th august 1941, aged 18. Son of Air Chief Marshal Sir Douglas Claude Strathern Evill, G.B.E., K.C.B., D.S.C., A.F.C, and of Lady Evill (nee Kleinwort), of Winchester. Inscription " He, being made perfect in a short time, fulfilled a long time". 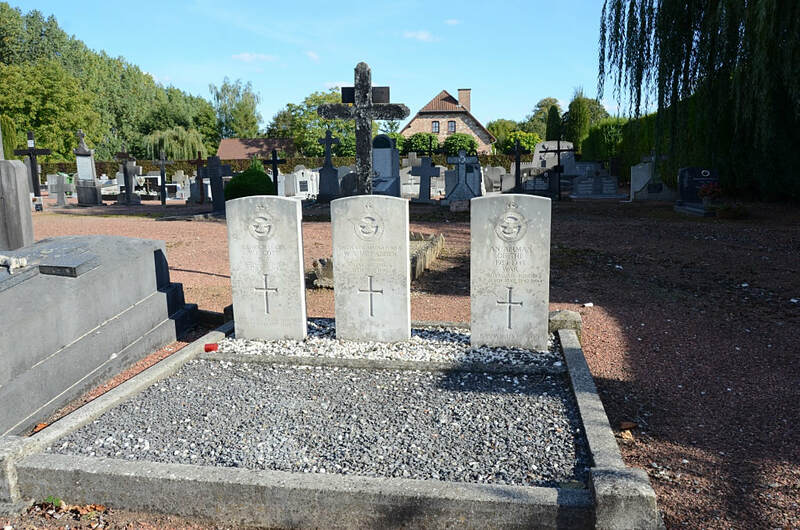 545595 Leading Aircraftman William Allan McFadden, Air Gunner in 139 Squadron, Royal Air Force, died 12th May 1940. 977255 Sergeant Cyril Patrick O'Dell, Wireless Operator/Air Gunner in 10 Squadron, Royal Air Force Volunteer Reserve, died 19th August 1941. 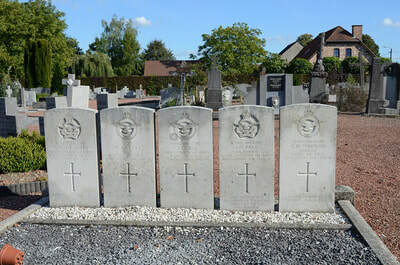 R/72165 Sergeant Thomas Hill Park, Air Gunner in 10 Squadron, Royal Canadian Air Force, died 19th August 1941, aged 32. Son of James and Charlotte Park, of Jersey City, U.S.A. Inscription " Our beloved son, an American volunteer who gave his life for freedom"
34225 Squadron Leader William Ian Scott, 139 Squadron, Royal Air Force, died 12th May 1940. Son of Samuel McAdam Scott and Margaret Green Scott, of Aberdeen. Inscription " They shall grow not old, as we are left grow old"
922929 Sergeant Kenneth Mervyn Tompkins, Observer in 10 Squadron, Royal Air Force Volunteer Reserve, died 19th August 1941, aged 18. Son of Frederick Richard and Gladys Emily Tompkins, of Bridport, Dorsetshire. Inscription " Loved, Remembered, Longed for always"